"We don't like the term natural disaster because no disasters are natural," said Dr. Missaka Hettiarachchi of the World Wildlife Fund (WWF) during a public forum at Northwestern last week. As Hettiarachchi and his colleague Anita van Breda explained during their seminar entitled Environment and Disasters: Global Emerging Practices for Reducing Risk, there is nothing naturalwhich is to say, there is nothing inevitableabout a disaster. The seminar hosted by Hettiarachchi and van Breda, both members of WWFs Environment and Disaster Management (EDM) program, was part of a larger two-day strategizing summit intended to further develop the ongoing partnership between Northwestern and WWF. The vulnerability, preparedness, response, and reconstruction of a community are all aspects of a disaster that can be predicted and managed, said Hettiarachchi, a civil and environmental engineer by training and EDM Fellow based in Sri Lanka. Case in point: last August, Hurricane Harvey broke the US record for rainfall from a single storm, dumping 51 inches of rain in parts of Texas. It became the second-most costly hurricane in the US, causing about $125 billion in damage and destroying or damaging 135,000 homesand much of this devastation could have been prevented. Eleven years prior, the US Army Corps of Engineers issued a report warning of the danger of flooding and urging public officials in the Houston area to take steps to mitigate the risk. The report was ignored. Our program really focuses on risk reduction as well as environmentally responsible recovery and reconstruction. We conceive and develop programs that work to minimize or eliminate negative environmental impacts from disaster recovery and reconstruction and maximize the benefits that a healthy environment can provide, said van Breda, Senior Director of the EDM program with more than 20 years' experience in conservation and disaster management. Since its inception following the Indian Ocean tsunami of 2004, WWFs EDM program has been hard at work providing on the ground guidance and training, for humanitarian and development organizations. 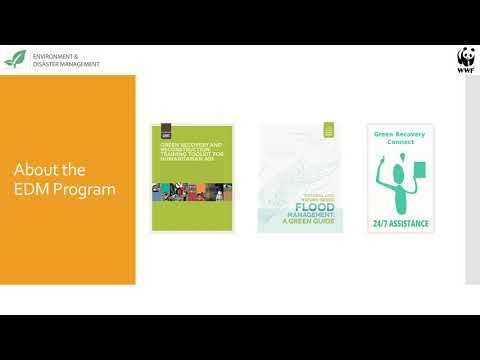 In addition to providing a twenty-four-hour information hotline for disaster responders, the EDM program has developed Green Recovery and Reconstruction: Training Toolkit for Humanitarian Aid (GRRT), Natural and Nature-based Flood Management: A Green Guide, and the Building Materials Environmental Guide (BMEG). The latter of these, designed to aid policymakers and project engineers in responsible disaster reconstruction and recovery, has been jointly developed with the Institute for Sustainability and Energy at Northwestern (ISEN) and students and faculty in Northwesterns Departments of Materials Science and Engineering, and Chemical and Biological Engineering. Article originally published by Northwestern Universitys Institute for Sustainability and Energy in Campus News.